Microcrystalline Cellulose, Hydroxypropyl Methylcellulose, Stearic Acid, Croscarmellose Sodium, Silicon Dioxide, Magnesium Stearate, Polyvinyl Alcohol, Talc, Polyethylene Glycol, Titanium Dioxide, Polysorbate 80, Blue #2. Do not exceed suggested daily serving. For adult males only. Before consuming TestroVax, consult your physician. 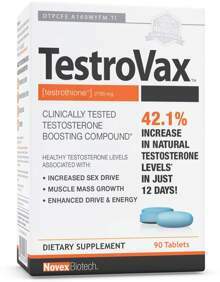 Do not use TestroVax if you have any pre-existing medical condition, including but not limited to: high or low blood pressure, cardiac arrhythmia, stroke, heart, liver, or thyroid disease, anxiety, depression, seizure disorder, psychiatric disease, diabetes, pernicious anemia, difficulty urinating due to prostate enlargement, or if you are taking an MAO inhibitor or any other medication. Discontinue use if sleeplessness, tremors, dizziness, nervousness, headache, or heart palpitations occur. Keep out of reach of children. Use only as directed.